I was really inspired by Hilary's post, here, on goal setting. And I really loved it. So I thought I'd do a bit of a review of 2012, since there is about a month or so left of 2012. And work on a list of what 2013 will hold. I'm pretty fond of making lists, its one of my favorite things to do. haha. 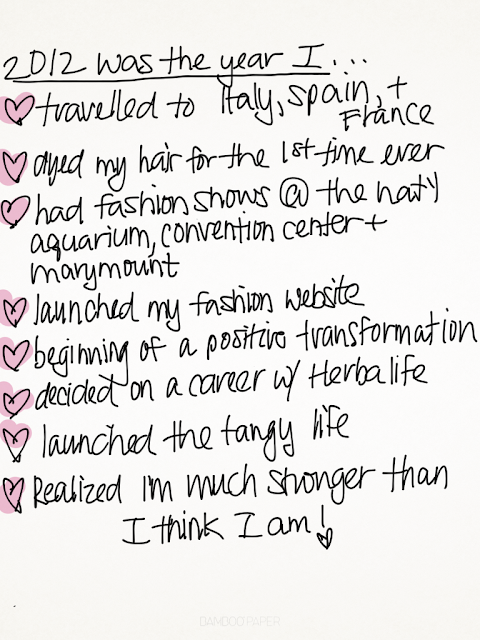 But I kind of had to rack my brain for some of the things I accomplished this year. I am planning for bigger and better things for 2013. For now, I'm keeping that list on the down low. ;) There is just so much change going on right now, and I'm loving it, and can't wait for some more wonderful amazing progress coming! You have definitely accomplished a lot this year. So awesome that you were able to list so many things and see them written in the history of your life. Can't wait to see your list this time next year. Oh I love this! Love the way you have it in your own handwriting. Makes it feel so much more personal & tangible to see your goals physically written out. :) And congratulations in all you made happen in 2012!! !